We see their spokespeople quoted in the papers and their ads on TV, but beyond that we know very little about how Australia’s lobby groups get what they want. This series shines a light on the strategies, political alignment and policy platforms of eight lobby groups that can influence this election. Housing affordability and tax reform have shaped up to be two of the defining issues this election. The Property Council of Australia – which describes itself as “the Voice of Leadership” – has helped frame the debate on behalf of its 2200 company members. The council began as the Building Owners and Managers’ Association of Australia (BOMA) in 1969, and was renamed the Property Council of Australia in 1996, with advocacy a core focus. The Residential Development Council and International and Capital Markets division were formed in 2001 and the Retirement Living Council in 2015. 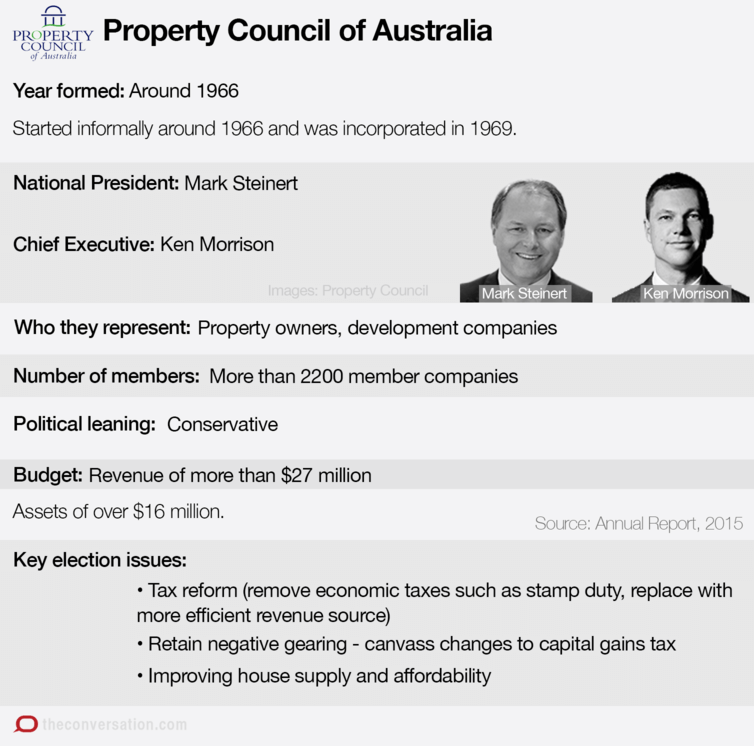 With a board of directors drawn from Australia’s largest residential and commercial developers, the Property Council’s considerable annual revenue (A$27.3 million in 2015) is drawn primarily from membership fees and services. The financial stakes are high when it comes to lobbying for regulatory settings which favour property development and investment. The Property Council’s healthy budget for advocacy and communication ($6.4 million and $1 million in 2015 alone) has generated a voluminous amount of reports, advertising campaigns and government submissions on taxation and planning reform. Another $7.2 million for “networking” ensures that this information is disseminated where it counts. The government has got the message. The Treasurer, Scott Morrison, who served as National Policy and Research Manager for the Council between 1989-1995 ruled out changes to negative gearing in the lead up to the 2016 Budget. Despite speaking out against negative gearing prior to becoming Prime Minister, Malcom Turnbull also changed his tune recently, rejecting “reckless” changes to existing arrangements and suggesting that aspiring home buyers hit up their parents for help. While the campaign to retain negative gearing is the Property Council’s most visible, behind the scenes the council has been busy meeting with government and writing submissions. In 2015 alone, the NSW division wrote 55 submissions and attended an extraordinary 230 government meetings. Its 2016 election brochure presents a number of “solutions” to “grow the economy through property”. Here are some highlights. The council wants to retain negative gearing (which allow interest rates and other expenses associated with housing investment to be offset against total income) and capital gains tax discounts on investment properties. This is despite substantial evidence that these bonuses stimulate demand for housing, pushing up prices and leaving first home buyers unable to compete. But by framing housing affordability problems as a symptom of supply side pressures rather than demand side incentives, the council shifts the affordability debate to planning reform. This is a tired argument which ignores the years of planning reform already undertaken by the states and territories, while levels of new housing production are currently at their highest in decades. This supply has done little to dampen price inflation in a market awash with domestic and foreign investors. 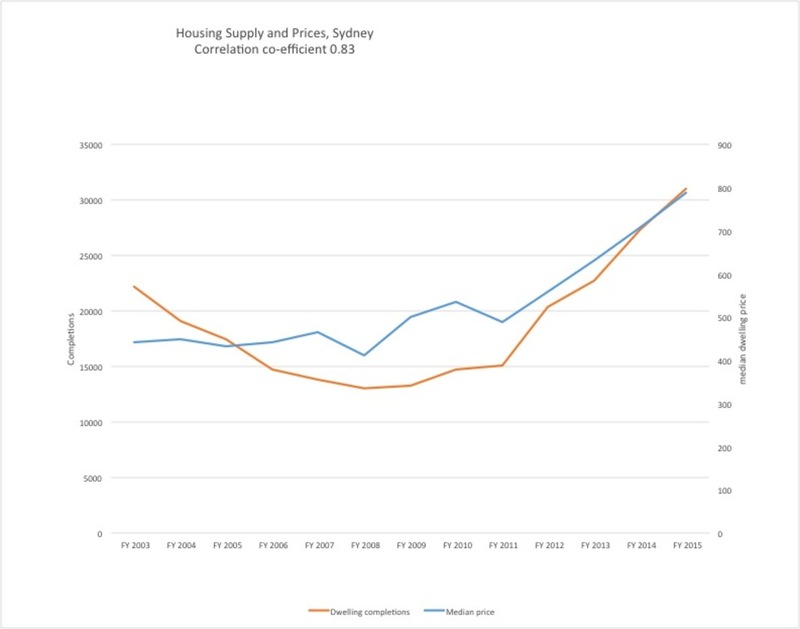 While the Property Council always bangs on about bottlenecks in housing supply (which it argues are caused by planning system constraints), such arguments miss the obvious issue that prices are a result of an interaction of supply and demand. What the combination of negative gearing and capital gains tax do is to drive demand so hard in boom times that even with sharp increases in supply, prices keep on rising, especially in today’s low interest environment. The chart below shows this problem with respect to Sydney. It shows dwelling completions falling slowly when prices flatlined after the 1996-2004 boom, but rising in line with price inflation from mid 2011 on. Prices: Department of Family and Community Services, Rent and Sales Report. The Council’s election platform does call for institutional investment in affordable and social housing, and this is one idea worth taking up. The Property Council support long term infrastructure planning and delivery, coordinated by Infrastructure Australia. Who doesn’t? But the problem is how to assign the costs and benefits. Land value rises due to investments in public infrastructure – such as a new rail line or road – are typically pocketed by landowners and developers. Commonwealth and state governments are now canvassing value capture arrangements which would use some of this uplift to offset costs of provision. The council oppose this model, instead suggesting Tax Increment Financing (TIF), which leverages increases to commercial rates in defined districts. While popular in some parts of the US, it has not been proven effective for larger schemes. It would be difficult to implement in Australia because our recurrent property charges are much lower than the US. The Property Council also wants existing development contributions towards basic facilities like open space, local roads, and footpaths to be wound back, along with stamp duties on property transactions. The idea of removing stamp duty has some merit (at least for domestic purchasers), since taxes on property transactions can discourage mobility, deterring retirees from moving to a smaller home, for example. But experts think stamp duty should be replaced by land taxes, to encourage more efficient use of land. This would also provide a mechanism for capturing back values arising from public infrastructure investment. Not surprisingly, the Property Council thinks otherwise, calling instead for a higher GST. While the Property Council complains about unfair tax burdens on its members, they seem content to spend a lot of money on their advocacy and networking activities. Described by economists as “premium seeking expenditure”, lobbying for more generous regulatory and financial settings clearly promises a high return for the property sector. But it’s important to remember that despite their size, the Property Council only represents a portion of the development, construction, and real estate industry – they don’t really cover many smaller suburban developers or house builders. The question is whether the “Voice of Leadership” will dominate the agenda or whether wider perspectives on housing and cities will be heard. Should Australians follow the British lead and boycott tax avoiders?